These last eleven days here at the Karma Triyana Dharmachakra Monastery located high on a mountain above the legendary Woodstock, New York have been extraordinary. I have been here many times, many long trips from Michigan and back. This series of 10-day Mahamudra intensives alone have gone on for 26 years and Margaret and I have not yet missed a one. And we have been here many other times as well, in the early years with all of our kids. Imagine that! The teaching ended yesterday afternoon and before I knew it, one after another, my fellow dharma brothers and sisters were streaming out of the complex, loading up their cars, and heading home or to an airport. This was such a gathering of senior students. Margaret and I stayed on for another day since tomorrow is a holiday and we decided not to drive the thirteen or fourteen hour trip when the highways are so packed. So I sat outside on one of the lovely teakwood benches and watched folks leave. Many hugs were had. This elaborate mandala was breaking up. Mandalas are offerings. We have all seen photos of the elaborate sand mandalas that the Tibetans create and then sweep into a river. Why destroy such a lovely creation? I guess it is that impermanence dictates that all “things” created in this world must end, their components scattered to the four elements. Mandalas are no different, and many do not understand what the actual mandala is. The key part of the elaborate sand mandalas is not the colored sand that is gathered up and thrown into the water. Dust to dust… or sand to sand. No, the mandala is the act of offering itself, the process of creation and not what is created. The mandala is the concentration, intent, life, prayers, and mantras we pour into the creation of the mandala, not just the resulting sand image which is destroyed. In this case, it is the process of offering itself that is the result. And this holds true for gatherings like these 10-day teaching as well. The offering itself, these precious teachings, unlike the sand, is not destroyed, but is dedicated to the eventual enlightenment of all sentient beings. Later as I sat in the daily Mahakala puja, a practice offered to the fierce dharmapalas, the protectors of the dharma, the sky just opened and poured rain. In Tibetan teachings it is considered auspicious if it rains during the teachings or at the end. Well, indeed this whole ten days has been auspicious. Many of the most senior students present said that this teaching was the most profound and glorious they had ever attended. I feel the same way. This was something we will be talking about for years to come, as I say, like the finale at the fireworks. And this reminds me of an important event in my life that occurred at the very first 10-day teaching, back in 1989. I have never told this story before except to a few, but I am getting old and there is no reason it has to be a secret other than vanity. This happened at the end of the first ten-day teaching in 1989, that last session when Rinpoche was saying goodbye to the group. There we were, sitting in the newly constructed great shrine hall which took so much effort and time to complete. Rinpoche was thanking all of us for coming, many from great distances. And he reflected on the original plans for this center, which came from his guru, the great 16th Karmapa, Rangjung Rigpe Dorje, whom I was fortunate to meet in 1974. And Rinpoche spoke of the yet unrealized plans of His Holiness the 16th Karmapa to also build a retreat facility, a place where men and women could be trained in the traditional Tibetan closed retreat that lasts three years, three months, and three days. And as he spoke, tears flowed down Rinpoche’s face that he had not been able to build such a retreat as His Holiness had requested. I can tell you, Rinpoche does not speak like this often, and there was not a dry eye in the place. When Rinpoche stopped speaking and we all headed out of the shrine room I was in a kind of shock. I can remember the exact moment and place where I was as I walked around the side of the monastery. I was so moved by Rinpoche’s sharing with us his dreams. And it had been so difficult just building the new monastery shrine hall that I had no idea how we would ever be able (so it seemed at the time) to build a whole retreat complex. I cast about in my mind to see who among the students that I was just sitting with would be capable of such a project and came up with only one option, and it took me by surprise. Perhaps only I could do such a thing, if I really put my heart into it. This realization found me shocked at the thought, but at the same time I knew I had to do it. My memory is not so good, but I must have sent a note or signaled somehow to rinpoche that I was willing to try to help make this retreat center a reality, because I got a message that Rinpoche wanted to see me. As I looked down I saw that he was handing me his own personal mala, giving it to me. Of course I and probably all of his students had seen this incredible mala that was worn down from use like none I had ever seen. I was speechless. Rinpoche was entrusting me with his own mala and at the same time the responsibility of furthering the retreat project. 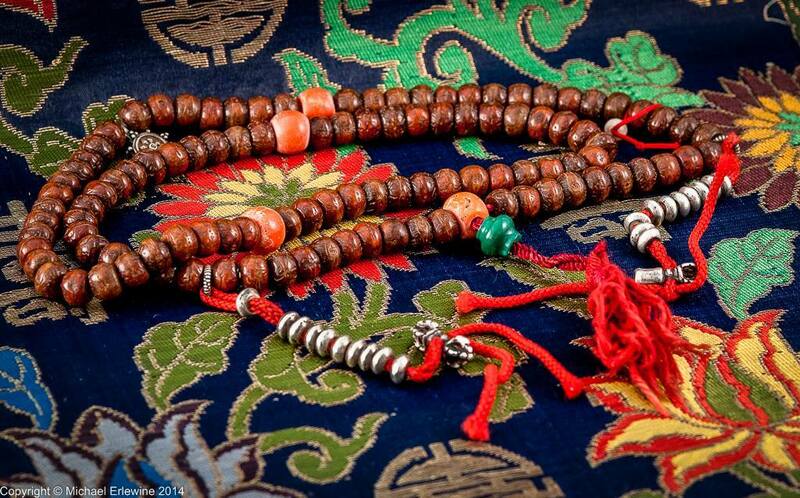 That was all that was said that day, those few words and the placing of that precious mala in my hands. When his translator learned of what Rinpoche had done, he was dumbfounded. He pointed out that Rinpoche had this mala from before he ever came to this country and had used it for many years to prepare for empowerment after empowerment, not to mention his own practice. And the translator said he had hoped one day to inherit it, but he was probably just kidding me. Well that’s my story and I am glad to have finally said it openly. As for the retreat center, my wife Margaret and I actually helped to create that center, working to raise the funds and organize the whole thing, along with help from the Chinese Buddhist community in and around New York. Our Chinese community is so incredible, so generous and so diligent. Americans are just beginning to learn how to support the dharma, if we want it flourish, but the Chinese are raised in this ethic. I am so thankful for their support. Anyway, the three-year retreat center was built. It is called Karmé Ling and is now in its fifth or sixth (I can’t remember which) three-year retreat, turning out fully-trained lamas. Today it is a whole complex, with a separate retreat house for men and woman, a lama house for Rinpoche and a great many separate retreat buildings for individuals. It also has a columbarium where the ashes of the sangha are placed. It is a wonderful place indeed. Later on when during a visit by Rinpoche to our center he went over his mala with me, almost bead by bead showing me where all of the parts came from, this bead from a particular great lama, another from the same lama but in a previous life and so on. Aside from my family, it is the most precious thing that I have, so precious that I am almost afraid to use it. So that’s my story. I am happy to get it out and tell it. Perhaps I will use the mala more now.